Ra Ra Riot is a band well versed in change. Their front man left within a year of the band’s formation, the original drummer died in 2007 from circumstances that are still being investigated, and after 2011’s critically acclaimed 2nd LP The Orchard, cellist Alexandra Lawn announced that she would be leaving the band. 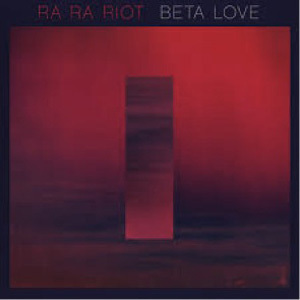 This makes Ra Ra Riot sound a lot more Spinal Tap than chamber pop, but with their 3rd LP, Beta Love (Barsuk Records), a change in sound is the big talking point. Gone are the preppy and charming arrangements of previous records, with the delicate and neatly arranged interplay between classic rock instruments and the cello and violin. However, the change in sound isn’t due to as simple a reason as a formation change. The record is said to have been inspired by the works of cyberpunk novelist William Gibson and futurist Ray Kurzweil. In Kurzweil’s book The Singularity Is Near, he describes his law of accelerating returns which predicts an exponential increase in technologies. He says this will lead to a technological singularity in the year 2045, a point where progress is so rapid it outstrips humans’ ability to comprehend it. Beta Love sounds like a record that has arrived in a time machine from 2045, complete with Back To The Future II clothing and an air of rambunctiousness. Unfortunately, as with the aforementioned near-miss of a sequel, it doesn’t exactly hit the spot. This entry was posted in Album reviews and tagged Ra Ra Riot. Bookmark the permalink.